Awin regret to inform you that USN is now closed. Awin regret to inform you that The Fragrance Shop is now closed. We regret to inform you that Tickettree is now closed. We regret to inform you that Ecco Shoes UK is now closed. We regret to inform you that Approved Foods is now closed. We regret to inform you that Think Hotels is now closed. 7 game changing beauty products delivered every month? No sweat. 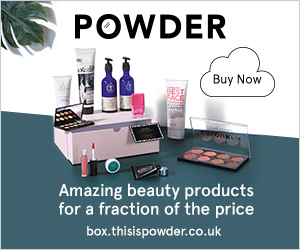 The Powder Beauty Drawer is a box filled with at least 7 game changing beauty products, delivered monthly, for a fraction of the price! Best beauty investment ever. FACT. Get over £60 worth of products for only £10 per month. That's not all, you can also enjoy 20% off your first box! Remember to change !!!id!!! to your publisher ID! We regret to inform you that ZipJet s now closed. We are very excited to launch the Powder affiliate program! The POWDER Beauty Drawer is a new personalised beauty box with a difference! Packed full with at least 8 amazing beauty products (many are full size!) from well-known premium beauty brands. Delivered right to the customers’ door so they can try out the best in beauty for a fraction of the price. Please don’t hesitate to contact me if you wish to schedule any additional exposure. We really hope to be working with you soon! Awin regret to inform you that Think Hotels will be closed on the 15/08/2017. Please remove all existing links by this date. All remaining commissions will be submitted to the advertiser for validation on the date of closure. Thank you for your efforts in promoting this merchant. We regret to inform you that LensOn (6035) is now closed. Summertime will be here sooner than you know (we promise! ), kicking off with Father’s Day on Sunday 18th of June. At National Lighting, we want to celebrate it with you and we have created an exclusive Awin campaign with two great vouchers so you can treat your customers with great discounts on our full lighting range. We are very excited to let you know about the latest Tesco Mobile SIMO offers that are currently available. Customers can now enjoy 6GB of data, 750 minutes as well as 5000 texts for just £12.50. For £17.50 a month customers can get 12GB of data, 5000 minutes and 5000 texts. F&F Clothing are offering 20% off select children's gifts for Christmas. Tesco Wine By The Case are offering free delivery on all orders from now until 11:59pm on the 8th January, in time to stock up for Christmas and New Year. Customers should order by 3pm Sunday to Friday for next day delivery, or can pick a suitable time slot for their wine to be delivered. Delivery takes place 7am to 7pm Monday to Saturday, where Saturday orders should be delivered the following Monday. Tesco Direct have today launched their toy catalogue ahead of Christmas, where 5 million copies have been printed and sent to stores. Those customers with a history of toy purchases will be directly mailed the catalogue, which has been designed to be fun and interactive for children. This includes; games, puzzles, competitions and stickers, which enables kids to highlight the toys they want for Christmas. Discover Tesco Direct's magical range of Star Toys, chosen as the top Christmas toys of the festive season, all collated onto one dedicated landing page found here. There's amazing toys for a variety of ages, from huge LEGO playsets, to fun fashion dolls and themed games. If you have any questions, please contact us on tesco@affiliatewindow.com.